Sunday night much of the world watched Skywire on the Discovery channel as Nik Wallenda completed a 1500 foot high wire walk across the Grand Canyon. This amazing feat certainly had social media buzzing, and it may have even inspired a few kids to stretch a cable across a backyard swingset to create their own version of skywire. 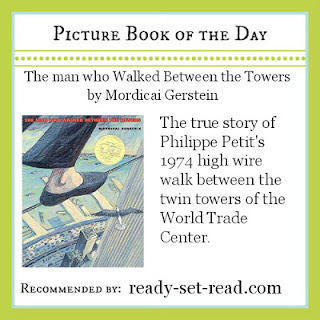 If your kids are interested in high wire walks, "The Man who Walked Between the Towers" by Mordicai Gerstein may be a picture book they would enjoy. Book Review: "The man who Walked Between the Towers"
The Man Who Walked Between the Towers is the true story of Philippe Petit who took a high wire walk on a cable stretched between the World Trade Center Twin Towers in August of 1974. This 2004 Caldecott medal book, tells how trained French high wire walker, Petit, planned his unauthorized walk while the towers were being constructed. The author describes Petit's experience on the wire using creative paintings and beautiful text. As the story unfolds, Petit walks, dances, lies down, and is eventually arrested. Fold out pages add drama to the high wire feat. The book ends with a tribute to the missing twin towers and to the memories that live there. The Man Who Walked Between the Towers is the winner of the 2004 Caldecott Medal, the winner of the 2004 Boston Globe - Horn Book Award for Picture Books, and the winner of the 2006 Carnegie Medal for Excellence in Children's Video. "The Man who Walked between the Towers" and Skywire both provide excellent writing opportunities to extend learning. Children can use the book, "The man who Walked Between the Towers" to compare the experience of watching Wallenda's walk on Skywire on the Discovery Channel. Nik Wallenda has many similarities to Philippe Petit that children may notice. Wallenda at 34 years of age holds 7 world records. He claims he is always always looking up in a a city and thinking about good places to walk. The book claims that Petit did the same thing! Of course, there are some differences between Philippe Petit's feat in "The man who Walked Between the Towers" and Nik Wallenda's walk on Skywire. Petit chose not to obtain permission to walk between the twin towers. It has been said that Wallenda would not have been able to obtain permission from the National Park Service to walk across the actual Grand Canyon landmark. He chose to walk near the Grand Canyon in an area provided by the Navajo nation instead. There is a lot of controversy surrounding Wallenda's walk as well as Petit's walk. The controversies surrounding both Wallenda's skywire and Petit's high wire walk may inspire some students to write argument or opinion pieces. 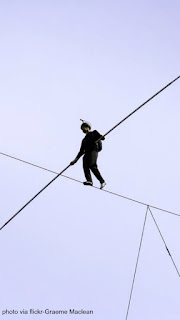 They might want to argue if Petit should or should not have sought permission before walking on the wire. They may want to give their opinion on walking on high wires or walking on high wire on television. Children can do additional research and discover that some are suggesting that Wallenda would like to walk between the Empire state building and the Chrysler building. Students could write opinion pieces on whether that walk should or should not be allowed. Picture Book of the Day: "The man who Walked Between the Towers"
"The Man who Walked Between the Towers" is an excellent book for kids from kindergarten through sixth grade. Each day I work with a group of bloggers to share a Picture book of the Day on my facebook page. "The man who Walked Between the Towers" will be my choice to for picture book of the day this week! Make sure you like my facebook page so you don't miss any of the great books that bloggers share each day. What a fabulous Caldecott winning book! And to think it's now historical since the twin towers are gone.